Johnny Wilkinson feels the pressure, and elects to phone a friend. It’s true, this really hap-pened! The six teams in the competition are Mae Jo, Chiang Mai University (CMU), the Barbarians, Rajabhat University, the host team Prince Royal’s, and an international team that plays under the name “Chiang Mai Suas”. Just in case your Thai language skills are not as finely honed as you might like, the word “Suas” translates as “Tigers”. Unfortunately, the Tigers took a bit of a mauling this Sunday, defeated by a Thai team, the Barbarians. However, the match final score of 20 – 17 suggests that the teams were pretty evenly matched, and that maybe, just maybe, a rematch could produce a reversal. In the earlier game, CMU defeated their rivals from Rajabhat by a score of 17-5. Tigers’ coach Sandy, philosophical in defeat, perhaps after the previous week’s handsome victory over Mae Jo, simply reminded his players of their midweek training commitments. When asked for his post match comments, he wisely opted to extol the virtues of finally uniting the disparate elements of Chiang Mai’s Rugby Union scene. The first time in maybe one hundred years, and possibly ever, that all the teams have all come together in organized fashion. Now, that certainly is a momentous moment for any sport in any region, and the atmosphere at the Prince Royal’s College rugby grounds this Sunday certainly matched the occasion. The grandstand was well stocked with supporters who were clearly knowledgeable, and pleasingly vocal in their support. On the pitch meanwhile, the games were competitive yet sporting, as one would expect in a sport with such pedigree. Moreover, the teams were exhibiting a remarkable level of teamwork and technique. Rucks and mauls were set up, promptly supported, and the ball frequently recycled. Passing was often admirably adept, and when some of the more fleet-footed players dropped a shoulder or feigned a pass to get past their man, the result was truly impressive. A nice neat scrumdown from Mae Jo and Prince Royal College. A great cure for a hangover, apparently. Not to mention the crunching tackles on the hard surface! Several of the players after Sunday’s game were proudly sporting bruises and bleeding wounds (just skin deep mind! ), and one or two were limping. God knows it’s a man’s game! None of this prancing around in shiny shirts like those soccer floozies, and then falling to the ground at the slightest touch, before rolling around in pseudo-agony for the cameras and Aunt Polly. No, none of that nonsense, just good old bone-shaking, jaw smashing, spine twisting, intestine squashing….fun!! 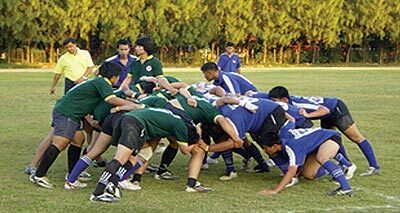 So if you would like to support Chiang Mai’s rugby scene, and be duly entertained in the process, then please come along to Prince Royal’s College Rugby Grounds. If you’re not sure where that is, then you might know CMIS, which is next door, all only a drop-kick away from the banks of the Ping River. Admission is free, at least I got away with it, and you can sit in comfort with an excellent view in the shady grandstand. Matches start at 1 p.m., and run pretty much all the way until 5.30 p.m.
Children in full body armor wielding bamboo swords are not what you would usually expect to see on campus at CMIS, but if it’s a Kendo Club day, that’s exactly what you’ll find. Eiji Osato (Osato Sensei) is the Kendo master who has been training CMIS students in the martial art of Japanese fencing for four years. This year he has eight returning students who range in age from six to seventeen years. All of them are very enthusiastic about their chosen sport. Naomi (age 11) and Dubin (age 12) say that they enjoy the social aspect of Kendo, and they also like the way it makes them feel strong and safe. Theo (age 11) has been practicing Kendo for four years and said that the sport has not only made him more physically fit, but also it’s a lot of fun. Supaporn (age 14) got involved because she has always been interested in Japanese culture. She especially likes the way the sport has strengthened her arms, and she aspires to become a Kendo teacher herself one day. Kendo means “The Way of the Sword” and is rooted in the tradition of Japanese Samurai warriors. It is a physically demanding sport that also emphasizes mental development. Kendo can help improve fitness and health through its focus on physical and mental speed and agility. The training also fosters development of the power of concentration, alertness, good reflexes, posture, and poise. 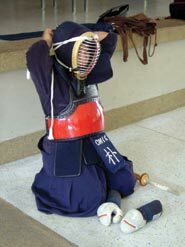 Kendo equipment consists of a bamboo practice sword, a uniform made up of a woven cotton top and pleated, skirt-like trousers, and a four-piece set of armor which includes a helmet, body protector, gloves, and a hip and groin protector. Competitors in Kendo tournaments use two types of attacks – strikes and thrusts – aimed at specified areas of their opponent’s body. Points are awarded by three judges, and the winner of a match is the first person to score two points. CMIS’s Kendo teacher, Osato Sensie, is the only Kendo Master in Chiang Mai. He became involved in the sport as a young boy in Japan, and through many years of dedication and practice has achieved the fifth rank, or ‘dan’. The first rank in Kendo is equivalent to a black belt in Karate, and the eighth rank is the highest rank attainable. Only Kendo practitioners who have reached the fifth dan or above are considered masters. 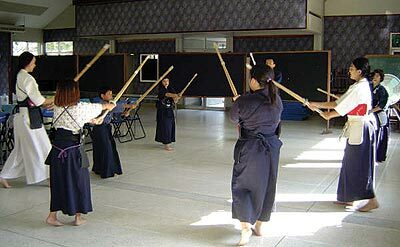 Osato Sensie estimates that there are between 200-300 people practicing Kendo in Thailand. He believes that much of the appeal of the sport, besides the obvious gains in fitness and self-discipline, is that people of all ages and abilities can take part. Osato Sensie emphasizes that whether you are five or 85, age is no barrier to your participation and progress in Kendo. If you’d like more information about Kendo, you can con-tact Eiji Osato at [email protected] hotmail.com or 0 5322 0519. Association (CMSCA) and won its first tournament in 2001. However it has been lean pickings for them since. Last Saturday turned that all around with a solid win in ‘The Sawasdee Tournament’ held at Prince Royal’s College (PRC). The field at PRC was an ideal setting for the Sawasdee tournament. Skills and cricket acumen are developing quickly amongst the younger players and they came well to the fore on Saturday, particularly in the PRC team which has three very skilled girl cricketers. 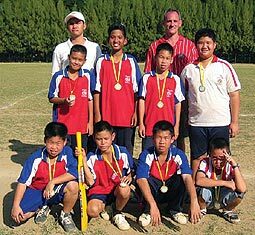 They are also the keenest players and without them, PRC would have had a very ordinary team. The evenness of the competition was evident with the closeness of the results with even the smallest school Sahagon2 competing well with the other much larger schools, including Saimoon and Montfort B.
Yuparaj Wittayalai School and Prince Royal College jointly arranged a traditional football match, their ninth, on the occasion of the 100th anniversary of King Rama VI giving names to the two educational institutes. 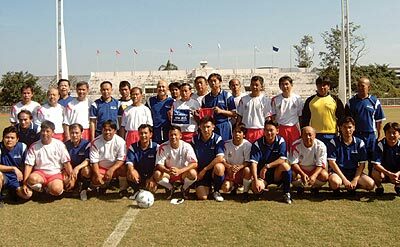 The game was held on November 26 at Chiang Mai municipality stadium and joined by many alumni of both schools. Kritsadaporn Siampakdi, Chiang Mai deputy governor, presided over the opening ceremony. He said the game aimed at creating unity between the students of the two schools. Yuparaj Wittayalai School celebrated its centenary on December 23-24 while Prince Royal College will celebrate on January 2. The schools were competing for a trophy from HRH Princess Petcharat Rajsuda, which was taken home by the team of Prince Royal’s College. In addition to the match there was a parade from the Three Kings Monument to Chiang Mai municipality stadium. On a day that saw Half Moon Pub stretch their lead to 4 points in the Chiang Mai Pool League, Blue Sky Bar shot up to second, as other top contenders suffered surprise defeats. Last week’s mid-table results created changes of positions and Happy Bar won their second game of the season. It’s beginning to look as if Half Moon Pub’s destiny rests in their own hands, as they eased past Blue Sky Garden 8-1 at home to extend a leading tally to 14 points from a possible 16. However Blue Sky Bar showed they’d far from conceded by moving back into second place with a comfortable win over near neighbors December Bar. They won’t have forgotten that lowly opposition took two points from the favorites, who can barely afford to repeat any slip-ups. At The Wall, the home side soon found themselves with a 3-0 advantage against The Local. But “The Grinders” turned the match into a grueling encounter by moving into snooker mode and clawing back the next four frames. This absorbing exhibition of safety pool went to 4-4 before The Local clinched the points at well past bedtime. 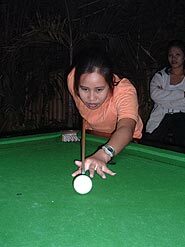 The standard of play in the Chiang Mai Pool League continues to improve and despite the odd runaway victory, most matches are closely fought. It was no surprise to me, therefore, that La Villa beat high flying Chiangers and Bangers 6-3 after losing only one singles, and Rock Hard Bistro ended a bad run by defeating Number 1 Pub, which recently recorded wins against Half Moon Pub and The Wall. Enjoy Place can also be pleased with their success at the expense of Out Back, with this week’s Ladies Hall of Fame girl, Tan, winning both her matches. And there’s no longer sympathy for Happy Bar, who triumphed again against Friend’s Corner. At 4-2 up, Happy hearts went in their mouths as a fierce Friend’s Corner fought back to level the score. But the Bar’s David kept a cool head in the last frame to plop the black home with only one other ball left on the table. Some pool players say that team responsibility can add pressure to the game and affect their performance. I guess everyone who plays sport is influenced by conditions in one way or other and I remember Frank. People laughed when Frank staggered drunk from his bar stool to challenge all-comers at pool. His eye would twitch and cue wobble when he bridged, and one wondered if he’d stand up again after playing a shot. But the guy could rattle off 12 or more consecutive wins in dazzling style. One Friday, I caught him before he’d reached a bar and asked him to turn out for us in the league. We watched with anticipation as he broke off and disbelief when he missed the pack. After that, if he managed to hit the ball he was aiming for it went miles wide and he ended the frame by sinking the black before he should have.